As the alumni association for SOAS in the United States, we are committed to supporting all American alumni and those alumni working or living in the U.S. in enabling personal & professional networking opportunities. While we are still very much growing and seeking to expand our community of alumni, there are a few resources currently available that we strongly encourage you to take advantage of in connecting with other SOASians. SOAS Connect is an online community exclusively for SOAS alumni. Here you can share contact and career details, expand your professional network and find an alumni mentor or mentee. This is a great way to network with fellow alumni and stay connected to the university! Are you looking to connect with fellow alumni in your area? Have you just relocated to a new area and are eager to make new connections? Are you searching for professional opportunities in a specific region? 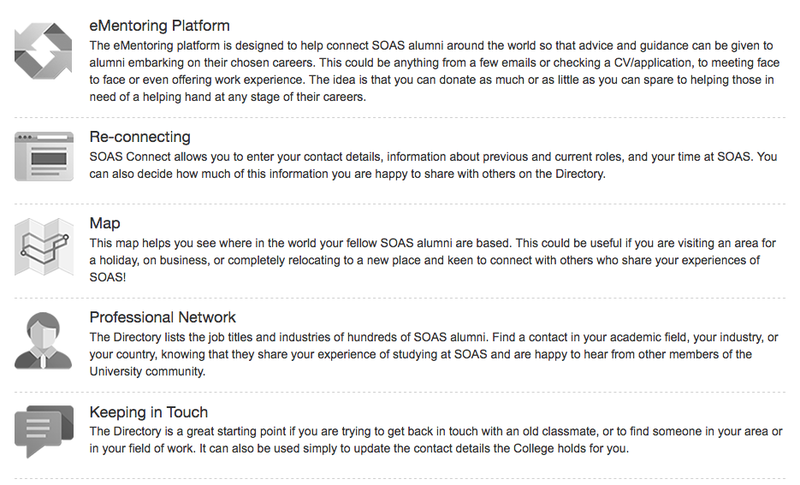 AFSOAS currently has budding alumni networks in the following 6 locations (with plans to add more locations soon!). Feel free to reach out to the respective contact persons in each location for more information about upcoming events, news, or general questions. LinkedIn is another great resource for searching for fellow alumni by geographic region, field of study, profession, etc. We encourage you to take advantage of this free resource, as there are literally thousands of alumni and current students on LinkedIn. Simply send a message and introduce yourself - on the whole, our alumni are incredibly responsive!